Shokkō is the Japanese pronunciation of the Chinese characters indicating the upper stream section of the Yangtze River in the present-day Sichuan Province in China. This region was quite famous for the clear waters of the river, and the embroidered silk cloth made there (Shokkō no nishiki) was very elegant and extremely popular. The shokkō patterns embroidered into this fine silk came to symbolise the region. 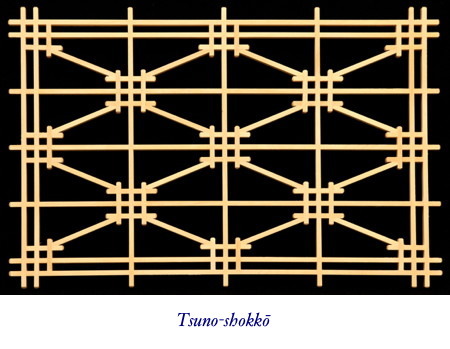 The many variations of the shokkō pattern are often used as a base or central band in shoji, or as a feature pattern in ranma. The jigumi in this shokkō design forms rectangles, and this requires two different angles for each jaguchi at both ends of the diagonal locking pieces. This, and the large number of cuts, is the most challenging aspect of this beautiful pattern. Tsuno means horn, and here instead of miter joints, the squares are formed by half-lap joints resulting in “horns” at the four corners. In this shokkō variation, the jigumi forms squares, and each jigumi joint contains a shokkō pattern with horns. These patterns are then connected by intersecting locking pieces. 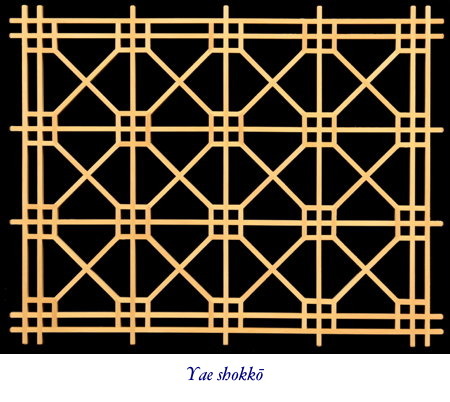 Yae means multiple, and this refers to the multiple shokkō patterns—one at each joint. The cuts for this pattern are relatively straightforward, but fitting the intersecting locking pieces can pose some difficulties if the marking and cutting is not accurate. 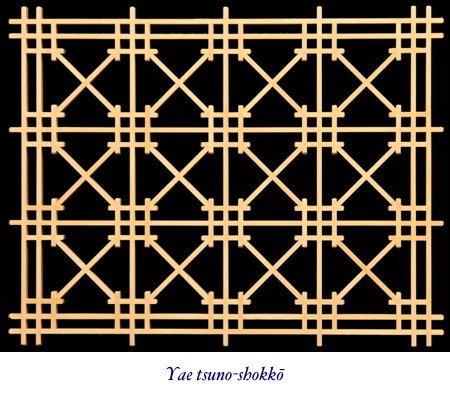 The yae shokkō is essentially the same pattern as the yae tsuno-shokkō, except the squares are formed with miters instead of half-lap joints with extensions, and the locking pieces are connected to the corners of the squares with jaguchi joints instead of fitting into the 90° corner formed by the extensions. The difficulty with this pattern is the intersecting locking pieces with a jaguchi joint on each end. In all other locking pieces, even those with a jaguchi joint on one end, we can “creep up” to the final length on one or more of the jigs for a tight fit, but because the jaguchi is at both ends, we only get one go at it—there’s no way of making minor adjustments to the length after it has been cut. The difficulty is further compounded by the need to have the half-lap exactly in the center of the locking piece. 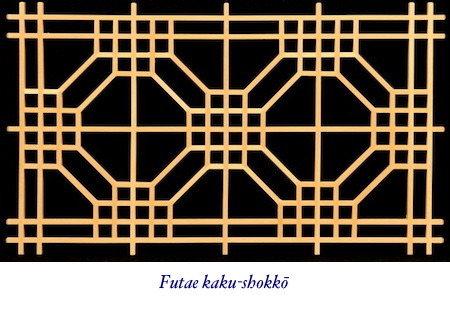 The main difficulty and time-consuming aspect of this attractive pattern is the sheer number of cuts, and while the locking pieces have the jaguchi joint at both ends, there are no half-lap joints to cut, so they are easier to cut than the locking pieces in some of the other shokkō patterns. The design itself is a series of two intersecting rectangles connected by twin locking pieces, so it is simple but very effective. This attractive pattern is closely linked to the kaku-tsunagi pattern. Looking at the pattern from a distance has the most impact. Initially the stars stand out, but change your focus ever so slightly, and suddenly the squares come to the foreground. Many other kumiko patterns have this same effect — a slight change of focus and there is suddenly a new pattern.